The key to success is to build a network infrastructure that will support the organization today and well into the future. While the structured cabling system represents a small portion of the overall network investment, it can represent nearly 80% of your network efficiency. 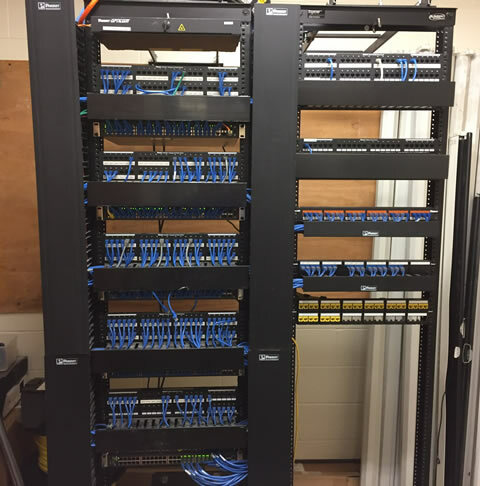 Our team of experienced and certified cabling engineers, technicians and installers can help you plan and execute a structured cabling system that’s optimized to provide reliable communications regardless of what applications the future brings. A Structured Cabling infrastructure that supports your wired and wireless networks will give you a flexible growth model and a way to implement the ever-evolving technologies of small businesses, data centers, smart buildings and IoT. Poor cabling and cable management can not only result in poor network performance but can significantly increase your repair costs and future expansion. Simply put, it is better to do it right the first time. Whether you’re building a new location or want to upgrade your existing infrastructure, Managed Controls is the only partner you need. Running a wire isn’t enough. If you want to know what the difference is between the pros and amateurs - it’s training, experience and certification. Our technicians use BICSI Standards and verify and certify each cable to make sure that your network is performing optimally to industry standards. Fiber Optic Cabling is more affordable now than ever. If you have an application where fiber cabling or splicing is required we can help, with an affordable high performance fiber optic cabling solution. Planning and organizing a network rack can make a big difference to the continued operation of your business network. We can help clean up that existing rack or network closet, or plan a new network rack for your expansion or new location.